Of course, the most common ways to correct vision are glasses and contact lenses. Unfortunately, the vision improvement is only temporary, as these only work when you are wearing them. Many people find glasses and contact lenses to be uncomfortable or inconvenient, and these may limit your ability to perform many sports or other activities. For many people, glasses are not cosmetically ideal. For people who have excellent distance vision but are over 45 years old and are thus having difficult focusing at near, reading glasses or blended monovision treatment with contacts or laser vision correction (see the section entitled Monovision Blended Vision) are the most common vision solutions. Recently, corneal inlays have become available. The two available types are the Kamra inlay by AcuFocus and the Raindrop inlay by ReVision Optics. Corneal inlays are small plastic lenses that are placed inside the cornea. These help to focus the light and help the eye to see better up close with only a minor negative effect upon the distance vision. Usually only one eye is treated. If the person is not happy with the vision, the inlay can be removed. Testing with a bifocal contact lens can usually determine who will like the vision with the inlay and who will not. Because a corneal inlay is a foreign body inside the cornea, inflammation is a problem and steroid eye drops are needed for many months after insertion. At the Caster Eye Center, we do not perform corneal inlays. We are bothered by the significant degree of inflammation that can sometimes occur after the inlay is placed. Also, in order to minimize the inflammation, the inlay must be placed deep within the cornea. With the current techniques, especially when combined with Lasik, this runs the risk of overly weakening of the cornea. Implantable contact lenses, also known as phakic intraocular lenses, phakic IOLs, or phakic implants, are tiny plastic or silicone lenses inserted inside the eye, behind the cornea. These lenses bend the incoming light rays and can correct higher amounts of nearsightedness. Intraocular implants have been used successfully for many years to the replace the eye’s crystalline lens when it turns cloudy, forming a cataract. To treat cataracts, the natural crystalline lens inside the eye is removed and replaced with an artificial lens. When used to treat nearsightedness, the natural crystalline lens remains inside the eye, and intraocular implants are placed in front of the crystalline lens. When the crystalline lens remains and an additional lens is placed inside the eye, that lens is known as a “phakic” lens. Implantable contact lenses can be thought of as placing glasses or contact lenses inside the eye, to stay there iThese multiple focus lenses ndefinitely. This gives the eye another focusing lens to provide high-quality vision like a normal eye. One style of implant is placed in front of the iris (the colored part of the eye) and is attached to the iris at each end. 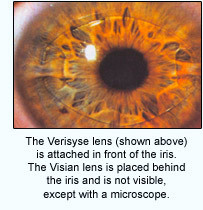 This is the Verisyse lens (outside of the United States it is known as the Artisan lens). Because the lens is in front of the iris, it can be seen in the eye under normal conditions. Another lens, known as the Visian lens, is placed behind the iris. The Visian lens is not visible inside the eye except with the use of a special microscope. Our preference is to use the Visian lens. Phakic IOLs are a more invasive treatment than laser vision correction. For this reason, implantable contact lenses are generally recommended for patients who are not good candidates for laser vision correction, either because the correction is too high or because the corneas are too thin. Certain physical characteristics of the eye may limit the ability to have phakic implants, including the size of the pupil (if too big, you could see around the lens, causing glare/halos), depth of the front portion of the eye, as well as the density of cells on the underside of the cornea. The implantation of a phakic implant is done as an outpatient in an ambulatory surgery center, under local or topical (eyedrop) anesthesia. A small incision (a few millimeters) is made to allow the insertion of the implant. Most patients experience little to no discomfort during the actual procedure, which usually takes around 30 minutes. Remarkably, many patients report an instantaneous, dramatic improvement in their vision, similar to LASIK. 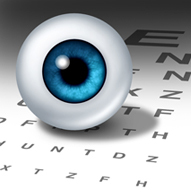 Implantable contact lenses can produce a very high quality of vision. If the lens is inappropriate for any reason (for example, if the vision in the eye changes), then the lens can be removed. Currently, the implantable contact lenses are limited to the correction of nearsightedness, but in the future astigmatism and farsightedness will be treatable as well. Presbyopia, which is the need for reading glasses, is not treatable with phakic lenses, though monovision is certainly an option. Lens Replacement is also known as Clear Lens Replacement, Clear Lens Extraction, or Natural Lens Replacement. The procedure is the same procedure as a cataract removal, except that it is performed in a patient whose lens is clear, rather than being cloudy (which is a cataract). 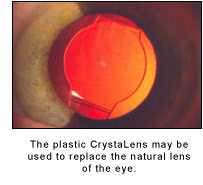 In Lens Replacement, the natural lens inside the eye is removed and replaced with a plastic lens. The new plastic lens will have a more accurate focusing power than the old lens, enabling the eye to see more clearly. Usually, the eye is adjusted to see more clearly at distance, though the eye can be adjusted to see at near if desired. New models of plastic lenses are now available that allow for near or intermediate vision in addition to distance vision. These lenses enable significant near or intermediate vision in addition to distance vision, but each has limitations, including halos at night, and the near or midrange vision is somewhat limited. Lens Replacement treatment is a more invasive procedure than Lasik. Because it involves entering the inside of the eye, infection is a more serious risk. For patients who are extremely nearsighted, there is an increased risk of retinal detachment. In addition, the plastic replacement lens does not focus near and far as well as a younger person’s natural lens, though it may focus near and far better than a late 50, 60 or 70 year old’s natural lens. Therefore, Lens Replacement is usually reserved for people in their late 50s or older who are too farsighted for Lasik. Corneal rings (also known as Intacs, intrastromal corneal rings, or ICR) are small pieces of plastic that are embedded in the edge of the cornea. The arc-shaped rings make the central portion of the cornea flatter, decreasing the amount of nearsightedness. Currently, corneal rings are available to treat only low amounts of nearsightedness, and treatments for astigmatism and farsightedness are still being developed. By using rings of varying thickness, different amounts of nearsightedness can be corrected. However, corneal rings are made in only a very limited number of thicknesses, so they can only be used for very specific corrections. If the visual result is not ideal, or if the eye changes in the future, the corneal rings can be removed, but there might not be another ring that is appropriate to correct the vision. In contrast, excimer laser treatments are available for a wide range of focusing errors and are easily adjustable with retreatments. NearVision CK, formally known as conductive keratoplasty, is a technique for improving near vision in people over 45 years old. 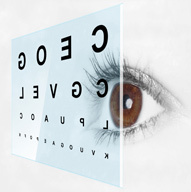 NearVision CK is useful for a person who has always had good distance vision (or had the distance vision corrected with Lasik) and who is having trouble seeing up-close. This condition is known as “presbyopia”, which means “old eyes”. 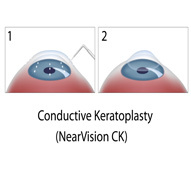 NearVision CK uses radio-frequency energy to change the curvature of the cornea. In NearVision CK, the energy is applied to the periphery of the cornea in sets of eight spots. 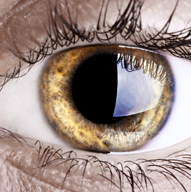 As this peripheral tissue constricts, the central cornea steepens, resulting in an improvement in near vision. The procedure takes about five minutes, and the patient is able to sit up and see the results immediately. No injections of any kind are needed, though an oral medication is usually given to cause relaxation; the procedure is performed using eyedrops to numb the eye. Like excimer laser surgery, RK corrects nearsightedness by altering the shape of the cornea. The doctor makes a series of incisions in the periphery of the cornea. This increases the corneal curvature slightly where the incisions are made, and decreases the curvature in the central portion of the cornea. The incisions are made in a radiating pattern, like the spokes on a bicycle wheel. By varying the number, length, depth, and location of these incisions, different amounts of nearsightedness can be corrected. Although patient satisfaction with RK was very high, RK has now been largely replaced by excimer laser techniques and is seldom used today. Laser vision correction technology produces results that are more accurate than RK and can treat a much wider range of focusing errors. Because of this greater accuracy, excimer laser patients are much less likely than RK patients to require a “touch-up” procedure. Also, RK patients experience side effects more commonly than do excimer laser patients. These side effects include “starbursts” when viewing a bright light against a dark background and fluctuation in vision throughout the day. RK patients, but not excimer laser patients, experience a temporary, reversible fluctuation in vision when at high altitudes. Pilots, mountain climbers, and skiers may be affected by this and should not have RK. We do not perform RK at the Caster Eye Center. Astigmatic keratotomy is a variation of RK (radial keratotomy), used to treat astigmatism. AK uses arc-shaped incisions in the cornea, whereas RK uses radial incisions, like the spokes of a wheel. At the Caster Eye Center, we do not perform RK or AK. AK is often performed at the same time as cataract surgery, to correct astigmatism that the cataract implant is not treating. For mild or moderate astigmatism, AK’s predictability is good but certainly not perfect. If astigmatism still remains after the cataract surgery, it often is more accurate to treat the astigmatism with laser vision correction than to use AK.